There’s a secret to the success I’ve had. And it is something I haven’t shared and haven’t seen anyone else directly discuss. Yet I’ve seen many, many people sabotage themselves in big and small ways by not doing this. It’s so simple, yet so hard for most people to do. The secret: Taking recommendations and advice immediately and correctly. I’m so passionate about this. It has led to not just to every book I’ve ever written, but to all of the greatest experiences and growth in my life. It is the reason why, when I start off learning a new skill, I’m usually the worst at it in the room, but tend to progress quickly to an advanced level. It is also the reason why I’ve been able to have great mentors: They see results. My obsession with taking advice ranges from small recommendations like books and restaurants to big recommendations around changing beliefs and behaviors. Most people think they take recommendations, but this isn’t true. They take advice only when hearing things they already agree with or that make sense to them or that don’t require any major changes–and that’s only if they remember the actual suggestions. Here’s the problem with that way of operating: If you are seeking advice, then clearly there is something you need help with in your life. And if you’re only acting on what “makes sense” or “is easy” or “sounds right” to you, then you’re not actually going to get out of the hole you’re in. You’ve been doing what “makes sense” all along on some level. I’ve found this to be especially true when it comes to human behavior: What “makes sense” and “is logical” is not always what’s actually effective. Or, on a personal level, to paraphrase The Truth: We’re too close to ourselves to see clearly enough to get out of our own way. It is the ideas that don’t make sense, the ideas that you resist, the ideas that seem stupid, the ideas that you mentally write-off, and especially the ideas that you form logical arguments against that will lead to your biggest breakthroughs. As the saying goes: What got you here won’t get you there. Of course, some of the suggestions and advice that you receive are going to lead to dead ends or not work for you. But there’s no harm in trying them if they don’t hurt you or anybody else. Even the advice that leads you to a dead end will help you grow. Why? Because now you know what doesn’t work. And often, along that path, you’ll find another trail to follow. That said, there’s a simple thing you can do to greatly increase the odds of outside advice working for you: Take it from someone who’s successful in that area. Chances are very high that you know someone who’s at least a little more knowledgeable than you in an area where you need help–or you can find a way to connect with an expert online or in person at an event of theirs. Some of my closest friends, who’ve gone on to become very successful, I actually met through cold emails they sent or through Society events. There’s another key to this: It’s not about just asking for advice. Many people do that. The key is in how you receive the advice. Here are a few things not to do when someone is trying to help you with good advice or a recommendation. A great article on what NOT to do when getting expert advice. 2. Give them more information or detail than they need. 3. Talk more than they’re talking. Tip for learning: Don’t speak more than the teacher. 4. Feel like they don’t understand or that your circumstances are unique. 6. Feel like you’re wasting their time. 7. Cherry-pick the parts of the advice you like and disregard the big picture. 9. Get upset because you feel criticized, frustrated, condescended to, or triggered in any way. 10. Guide them into saying exactly what you want to hear by being unreceptive to everything else. 11. Totally agree, then walk away and decide the advice isn’t right for you after all. 12. Totally agree, then walk away, only remember the parts you agreed with, and keep doing the same thing you’ve always done while thinking you’re actually following the advice. 13. Totally agree, but fail to implement the advice, then lie to them and pretend like you did it because you don’t want to disappoint them. Let’s calls this The Stuck Cycle. Here’s what will happen if you live here: People will give up on you. They will lose respect for you. They will stop giving you advice or even empathy. Your friends may even cut you off. 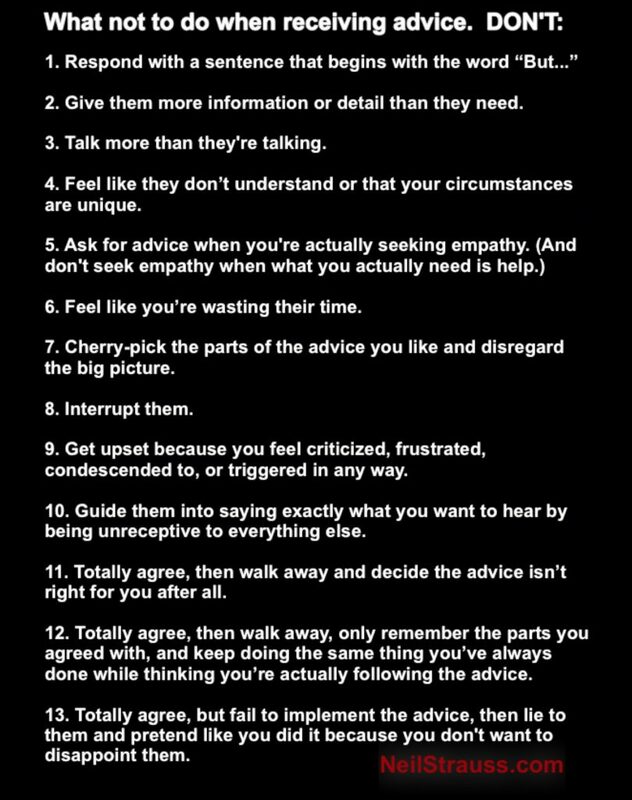 So instead, here are ten things to do when receiving advice, in order. 1. State your question or problem clearly. 2. Answer follow-up questions directly and honestly. 6. Ask for clarification when you don’t understand. 7. Repeat your main takeaways afterward to make sure you understood correctly. 8. Ask if there’s anything else you need to know or do. 9. Try it, if it won’t hurt. 10. Share your results with them, both the successes and challenges, then repeat these steps from the top. Let’s call this The Learning Cycle. It’s an easy formula to read. But it is challenging to do. It’s challenging because we often don’t listen well, with our filters off. But more so, it’s difficult to break entrenched habits, both of behavior and of thinking. There’s a reason why a big positive change is called a breakthrough: you have to break through your resistance, habits, and fears to get there. But it’s worth it: If you have an issue and you go through the learning cycle just a few times on an issue, then it will likely no longer be an issue. No matter who you are, chances are that there are people in your life (or whose blog posts you’re reading!) who are telling you exactly what you need. They know the solution–or at least a solution. They can see it where you can’t. Some of them have been telling it to you over and over. Others have given up on you. Why hire a coach when your friends work for free? Show them this week that you’re ready to really understand and implement the advice that you haven’t been hearing. That you’re ready to enter the learning cycle and have the breakthroughs both you and they have been waiting for. Even with the small recommendations that you receive, start a list on paper or in your favorite note-taking app: Every time someone you respect suggests anything, whether an article to read or a restaurant to try or a productivity tip to use, write it down next to their name. Then reach out and thank them once you try it (that is, if you like it). You’ll find that life will start to open up so much more easily, beautifully, and powerfully for you as a result. 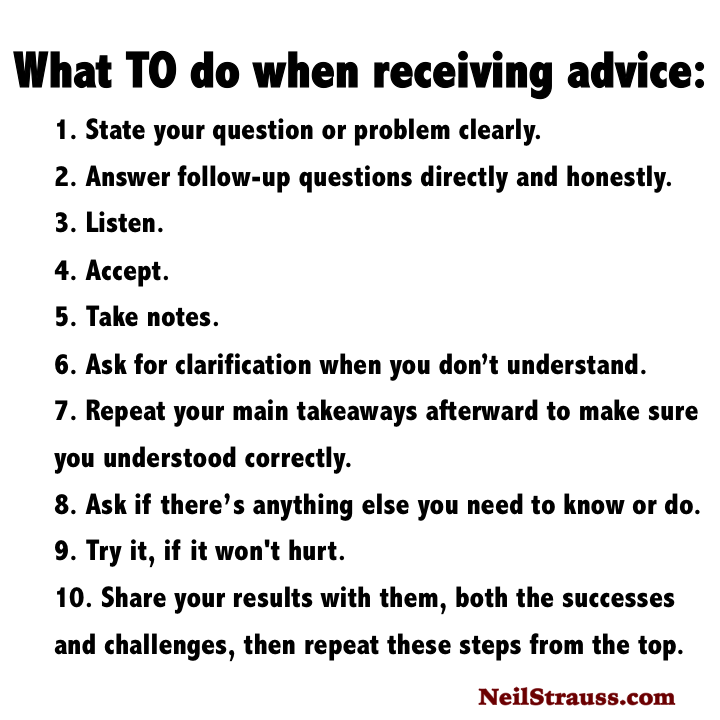 How to take advice: listen, accept, take notes, clarify, repeat takeaways, try it, share results.